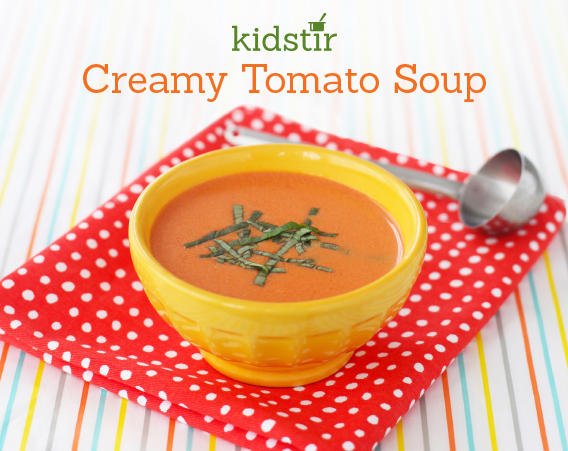 If you love cream of tomato soup, try making it from scratch with our quick and easy recipe. Add a little extra flavor with fresh basil (or stir in some Cheddar cheese cubes just before serving!). 1. A grown-up should heat the olive oil over medium heat in a soup pot. Once hot, add the onions and cook, stirring occasionally, until soft, about 10 minutes. Add the garlic and cook for 1 more minute. Turn off the heat. 2. Blend the whole tomatoes and all the juices in a blender. Add the cooked onion and garlic, and blend until smooth. 3. Carefully pour the pureed tomatoes into the soup pot. Turn the heat to medium-high. 4. Stir in the cream and cook for about 10 minutes. Add salt and pepper to taste and extra cream, if you'd like. 5. Ladle the soup into bowls. Stir in cubes of Cheddar cheese, if you'd like. Top with chopped fresh basil and pass the salt and pepper!